Better health with proven products. Good Health is Impossible without a Strong Heart! ProArgi-9 Plus for Heart & Cardiovascular Health, also used to improve athletic performance. 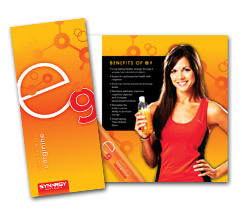 E9 Energy Drink, a natural powerhouse without caffiene jitters. Phytosterols, Amino acids. What every body needs! Core Greens - The greens we all need for great health! Link to Videos by Dr Prendergast as well as other medical Professionals on Pro-Argi9, Vitamin D and much more. ProArgi-9 Plus is Synergy’s top selling product and the cornerstone of any nutritional regimen. One serving contains 5,000 mg (5 grams) of elemental pharmaceutical grade l-arginine. Often referred to as the “miracle molecule,” l-arginine has potent health-enhancing properties. The remarkable properties of l-arginine were validated by the 1998 Nobel Prize in Medicine, and since then have created a frenzy of interest in the pharmaceutical and nutraceutical fields. The efficacy of l-arginine as a therapeutic agent has been validated by thousands of scientific clinical studies. ProArgi-9 Plus was formulated in collaboration with leading l-arginine researchers such as J. Joseph Prendergast and other cardiovascular specialists who have conducted pioneering research in the proper application of l-arginine in promoting cardiovascular health. These experts have helped create the best l-arginine product on the market. L-arginine is best known for its cardiovascular benefits. In the body, l-arginine is converted to nitric oxide, which relaxes the blood vessels. This reduces stress on the heart and improves circulation. L-arginine is the body's major source for nitric oxide synthesis. Without nitric oxide, human life would not be possible. L-arginine also reduces blood viscosity. Scientific studies have shown that l-arginine significantly reduces blood pressure levels. L-arginine also enhances health in a number of other ways. It improves immune function, promotes healthy sexual function, may boost energy levels, helps to build muscle, and reduces adipose tissue body fat. ProArgi-9 Plus is a unique product with far-reaching health benefits and powerful support for the cardiovascular system. With ProArgi-9 Plus, you’re giving your body the support necessary for a long, healthy life. L-arginine is a vital amino acid that plays a role in a number of physiological functions in the body, but is best known for its cardiovascular benefits. In the body, l-arginine is converted to nitric oxide, which relaxes the blood vessels and regulates blood vessel tone and flexibility. This reduces stress on the heart, improves circulation, and lowers blood pressure. Citrulline - The amino acid citrulline is metabolized to yield more l-arginine, which in turn provides additional nitric oxide. Citrulline helps to optimize blood flow throughout the body and promote healthy energy levels. Folic Acid, Vitamins B6 and B12 - These ingredients work together to naturally decrease homocysteine levels. Red wine extract - This ingredient is high in antioxidants, anthocyanins, and polyphenols, which help protect the heart and reduce LDL oxidation. Pomegranate - Pomegranate contains superior antioxidants, known as punicalagins and ellagic acid. Pomegranate inhibits LDL oxidation, supports arterial wall strength, and enhances the activity of eNOS, the enzyme responsible for converting l-arginine to nitric oxide. Vitamin K2 - This vitamin keeps calcium in the bones and out of the arteries. Vitamin D3 - This vitamin has long been known to aid in calcium absorption, but new research shows that D3 also plays a role in healthy cardiovascular function and supports healthy inflammatory response. Ribose - Ribose is a naturally occurring sugar that has been extensively studied for its ability to enhance the recovery of energy compounds in heart cells. Xylitol - This ingredient is a low glycemic sweetener that occurs naturally in the body. Unlike other sweeteners, xylitol has been shown to promote saliva production providing protection against tooth decay. You have allergies or asthma. You have cirrhosis of the liver. Your have low blood pressure. Are there any interactions with medications? No interactions have been experienced but consult your physician if your are on medications for the above situations. PLEASE Discuss taking this product with your doctor and your pharmacist if you have any of the above conditions or if you are on any medications such as blood thinners. We bring this to you as a possible solution but you must do your due diligence as we are not doctors and do not diagnose or treat, we only offer solutions that are having positive effects for others and may provide the similar benefits for you. Note: maintenance levels are 1-2 scoops/ serving per day. For symptom reduction larger quantities will need to be consumed over the short term before reducing daily intake to maintenance levels. maximum recommended intake is 4 servings per/day. 2 in the morning plus 2 at night. If experiencing detox reactions such as headache, minor dizziness or Diarrhea, Consider taking all 4 scoops approx 1 -1 1/2 hours before bed on an empty stomach. ProArgi-9 Best Value is the Jumbo. Ultrasound Med Biol. 2008 Mar;34(3):487-93. Epub 2007 Oct 15. Nitric oxide generation directly responds to ultrasound exposure. Sugita Y, Mizuno S, Nakayama N, Iwaki T, Murakami E, Wang Z, Endoh R, Furuhata H.
Medical Engineering Laboratory, Jikei University School of Medicine, Tokyo, Japan. Recently, several reports have been published on ultrasonic vascular dilation produced with relatively low-frequency ultrasound. It has been speculated that nitric oxide (NO) is an important factor for this ultrasonic vascular dilation. However, a quantitative relationship between the ultrasound intensity and NO generation was not clarified in these reports. We investigated the quantity of NO generated by various ultrasonic intensities by means of real-time measurement of NO concentration in the adductor muscles of the thigh of New Zealand white rabbits exposed to a continuous-wave ultrasound (490 kHz). In the quantitative relationship between NO generation and ultrasonic intensity, the percent increase in NO concentration was 1.25% +/- 1.25%, 10.6% +/- 2.9% and 20.1% +/- 3.5%, with the maximum muscle temperature increase 0.5 +/- 0.2 degrees C, 0.7 +/- 0.2 degrees C, and 0.8 +/- 0.3 degrees C at the ultrasonic intensity (SPTA) of 0.21, 0.35 and 0.48 W/cm(2), respectively. The effect of ultrasound on NO generation was intensity-dependent with a progressive increase from 0.21 W/cm(2) to 0.48 W/cm(2) without significant thermal effect. Ultrasonic NO generation was partially reduced by NOS inhibitor of L-NMMA, clarifying that ultrasound can activate both NOS-dependent and NOS-independent NO generation. These new findings provided scientific basis for ultrasonic vasodilatation and support the potentiality of a new ultrasonic technology for the treatment and prevention of the ischemic tissue based on the new concept of NO generated angiogenesis. (E-mail: furuhata@jikei.ac.jp). 1. It is one thousand times more powerful than any naturally occurring antioxidant in the body. Arginine’s antioxidant properties support various body systems and may protect against hearts disease, stroke, cancer, and diabetes, as well as slowing down premature aging. 2. It offers wide-ranging cardiovascular support, including controlling blood pressure and plaque formation. Nitric oxide keeps arteries relaxed and pliable for normal blood pressure, preventing hypertension and angina. 3. It enhances memory, particularly long-term memory, and may help to reverse the effects of dementia and Alzheimer’s disease. 4. It boosts human growth hormone (HGH) production, which has anti-aging properties. 5. It enhances communication of messenger cells between nerves and the brain. 6. It may help improve immune function and fight bacterial infections. 7. It may prevent and possibly reverse the effects of osteoporosis by positively affecting bone mass. 8. It may help in the treatment and prevention of diabetes since many disease complications, including poor circulation and blindness, are vascular in nature. Arginine is found to regulate insulin secretion in the pancreas. 9. It may inhibit the division and proliferation of cancer cells. 10. It helps with cholesterol control by lowering serum and LDL cholesterol levels. 11. It enhances male sexual performance by treating vascular erectile dysfunction. 12. Its anticoagulant abilities reduce clotting to lower heart attack and stroke risk. 13. It reduces pregnancy-related hypertension, a risk factor for both the expecting mother and the unborn child. 14. It boosts lean muscle mass and preserves bone density by encouraging HGH production, which also leads to a reduction in fatty tissue. As a result, it may be useful in weight management and strength training. 15. It can help offset cardiovascular and lung damage caused by tobacco use, since nitric oxide levels in smokers are less than half of those found in non-smokers. 16. It helps to accelerate wound healing and post-surgery recovery. Research has shown it is useful in treating burn wounds and stimulates wound healing in the elderly. 17. It relaxes hypertonic sphincter muscles, preventing and healing hemorrhoids. 18. It may be useful in enhancing athletic performance due to its ability to boost exercise tolerance. Its beneficial effect on the lungs, and its effect on HGH levels, which helps with building lean muscle tissue. 19. It may be used to improve the function of the prostrate. 20. It is useful in the treatment of asthma by opening pulmonary pathways for easier breathing and the treatment of lung disorders. 21. It has been used in the treatment of irritable bowel syndrome and to reduce the occurrence of ulcers – especially stress related –without affecting gastric acid production. 22. It may improve renal function and slow the production of renal disease and age-related chronic renal failure. Arginine’s protective effect on the kidneys may also benefit those with diabetes. -Has similar cholesterol lowering benefits as prescription drugs. -Helps inhibits tumor cell growth and metastasis. -Helps improve cell numbers and activity in cancer patients. -Beneficial to pancreas and production of insulin. -Benefits thyroid, which is the modulator of nitric oxide and erections. -8 ml of arginine daily, over six months, improved sperm motility in infertile men. -Benefits hepatitis in 20 days. -Benefits pro-biotic growth and performance. -Helps reduce the effects of stress. -Protects brain tissues from damages of stroke. -Helps improve brain function and protect against Alzheimer’s disease. -Helps restore intestinal mucosa digestion. -Helps prevent and improve healing of ulcers. -Helps improve nitric oxide cycle benefiting male erection and dysfunction. -Helps bones grow normally and have helped some children increase height. cartilage and bone growth and function. -Helps protect lungs and improve healing from smoke damage. -Helps protect the heart muscle by simulating myocardial cell growth and re-growth. Synergy WorldWide’s ProArgi-9 Plus contains 5 grams of elemental pharmaceutical grade l-arginine. Medical sources recommend at least 5 grams of l-arginine daily to receive optimal health benefits. throughout the body and protect against the negative effects of cardiovascular aging. and help support healthy cholesterol levels. enzyme responsible for converting l-arginine to NO. Vitamin K2 keeps calcium in the bones and out of the arteries where it could lead to arterial calcification. potential for coronary heart disease. stores in heart muscle as well as skeletal muscle cells. inhibit oral bacteria, and promote saliva production providing protection against tooth decay. work with Synergy to oversee the design, manufacturing and production of all Synergy products. Australia for at least 13 or more years.